After turning Kendrick Lamar's "HUMBLE." into a country song on South Park last week, Trey Parker and Matt Stone have now pointed their parody machine at Logic for more rap humour. In the latest episode, Parker and Stone parody Logic, Khalid and Alessia Cara's "1-800-273-8255" by having Eric Cartman rap a similar song of suicide awareness. As his classmates canvas the hallways to raise awareness for distracted driving, Cartman takes over the PA system to sing, "Eric, we don't want you to die / Eric, give life a try." 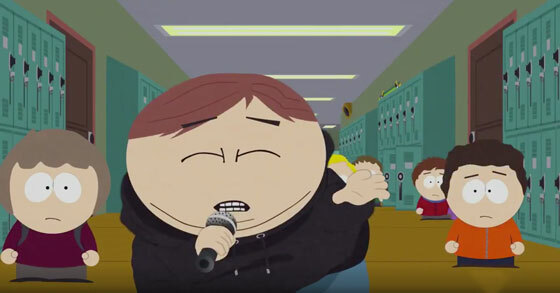 In reference to Logic's performance at this year's MTV Video Music Awards, Cartman is dressed in a black hoodie and recites a monologue before dropping the mic. You can watch the clip in the player below. You can watch the new episode here in the U.S. and eventually over here in Canada. The long-delayed South Park videogame The Fractured But Whole — a game that's harder if your character is black — is also due out on October 17. Logic Shares "Confessions of a Dangerous Mind"
​Alessia Cara Returns to Social Media Following the "Shortest Break Ever"
Alessia Cara Calls Out Online "Stan Culture"
​Khalid Admits to Ghosting on New Single "My Bad"